Buy your dream car using the carefully collated information here - Get complete information on Tata Zest D - prices, engine performance and other features in this exhaustive automobile and bike section. Madrasi.info is your Chennai city guide. From automobiles to education, from latest cars to travel destinations, you will find it all here. Tata Zest comes loaded with features not seen in its class - automatic transmission, projector headlights, LED DRL and tail lamps. It has the latest generation ABS, EBD and 2 airbags for maximum safety. Tata Zest may well set the sales chart on fire for Tata motors. Zest diesel has the time tested Quadrajet engine that is mated to Ftronic - AMT - automated manual transmission in the XT version. Zest has many first-in-class incredible features - Projector headlights with LED guide rings, LED DRL (daytime running lights) and LED tail lamps, 15 inch sporty alloy wheels, fully automatic AC and ePAS ( Electric Power assisted Steering). 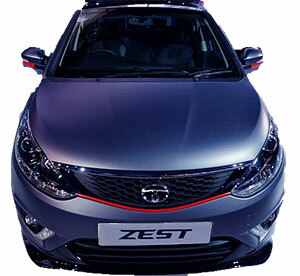 True to Tata's slogan - More Car per Car - Zest offers unbeatable Safety features too - 9th generation ABS, EBD and 2 Airbags. Zest also has the top of the line Harman ICE with touch sensitive control panel that can also accept voice instructions. If you think we have given a positive review about this Zest car - yes - we are duly impressed. Tata Zest D Specifications: Tata Zest D has 1.3 L Quadrajet engine which delivers 90 BHP with a torque figure of 200 Nm. This model comes with Air conditioning as standard fitting. Zest from Tata has Power steering and Power Windows. It is outfitted with central door locking in tune with its class. Tata Zest D - Small Car segment is equipped with a 5 speed gearbox. Tata Zest D Price: Tata Zest D in India costs approximately about Rs. 6.89 lakhs (showroom price)for the base version in Chennai( Price may vary depending upon the local taxes and Octroi ) at the time of publishing this page. Please note that the car manufacturer - Tata may increase/decrease the list price at any time. Again you may note that the price mentioned here is for the Diesel variant. On the road price will depend on the GST, Road tax, Insurance and extended warranty fees if any. Zest Fuel Economy: This car runs 16 km per liter of Diesel in city driving conditions while it runs 19 km per liter of Diesel in highway conditions. In other words, the fuel economy of Zest is Rs. 4.44 per kilometer. If you drive about 1000 km in a month, you will be spending about Rs. 4440 on your fuel ( at the prevailing fuel price in Chennai). Your actual mileage may vary. The information presented in this page has been collected from the respective web site of the manufacturer amongst other reliable sources. We have summarized the various features of this Tata Zest D in a tabular format below.